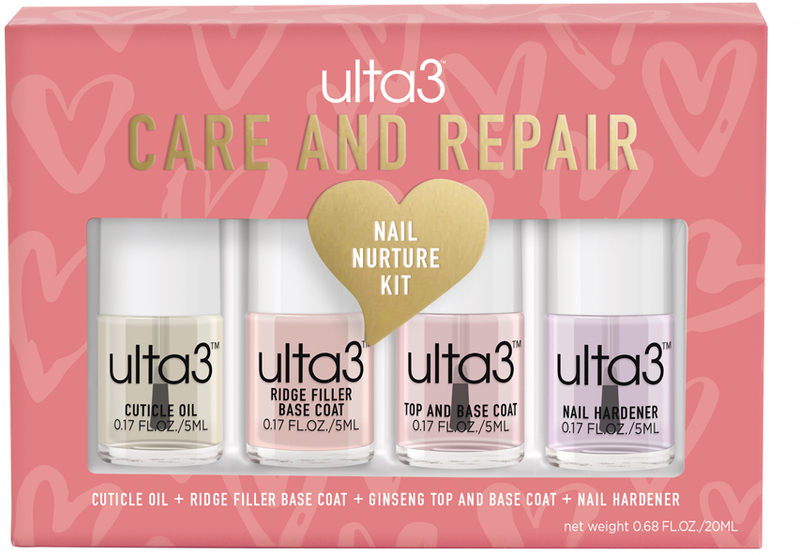 ulta3 Care and Repair Nail Nurture Kit is a nail care gift set for Mother’s Day. It contains four mini-sized nail repair treatments, including Cuticle Oil, Ridge Filler Base Coat, Ginseng Top and Base Coat, and Nail Hardener. I bought this set for only $5.37 so it's incredible value for a base coat, top coat, nail hardener and cuticle oil - basically everything you need to prep and prime your nails! My biggest qualm with the product is that the bottles are tiny so they're a little difficult to hold and use. They're 5mL mini bottles, while most nail polishes are 13mL, so keep that in mind. I find the performance average but they do dry very quickly, which is a plus. Right now I'm not sure if I would repurchase but I'm definitely going to use them all up and update this review if needed.